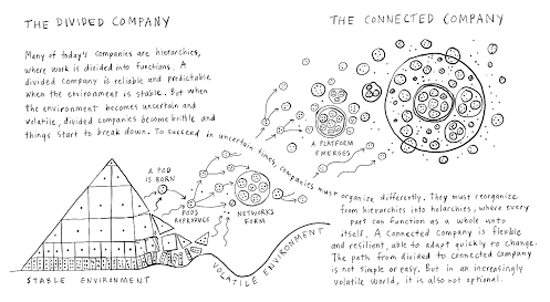 I think that Dave Gray’s recent book The Connected Company offers a useful approach to understanding how human connections in business today require organizations to develop the adaptive capabilities that underpin institutional innovation. Dave’s analysis draws especially from the thinking of John Hagel and John Seely Brown’s work at the Deloitte Center for the Edge. However, I think Dave’s ability to visualize and explain the workings of innovation adds significantly to the framework offered in Hagel and Seeley Brown’s The Big Shift. I plan to offer several more posts over the next few months that discuss key concepts, e.g. pods and podular design, from Dave’s book and the challenges it describes. I make no claim to represent Dave’s thought. Only to offer a few insights into how the interactions of people in the network connections afforded by specific institutions contribute to collaboration and improved business outcomes. The visualization above is the closest I’ve seen in Dave’s depictions of how companies change from divided organization to connected organization, as pods replace traditional teams to drive the business. The next few posts I plan will attempt to communicate why Dave’s thinking in The Connected Company is a significant contribution to the ongoing dialogue about collaboration, innovation, and business organization. For now I’ll leave with this insight from Dave regarding the importance of understanding what we take for granted when we think about organizational design. There are things that seem “obvious” about organization design that are in fact not so obvious at all. Some things that we take for granted as fundamental are in fact only optional. …We divide the buisness –and the labor– in order to do work more efficiently. We put the sotware developers together so they can focus on software; we put the salespeople together so they can focus on selling and learn from each other; and so on. Sounds obvious, yes? And its very efficient. But as we move into a world where efficiency leads to commoditization, and where value will increasingly be driven by innovation, efficiency is no longer the overarching goal. This entry was posted on Thursday, January 31st, 2013 at 3:34 pm and is filed under Change Management, Collaboration, Experience Design, Innovation, Social Business Design, Social Media, Social Networks, Web 2.0. You can follow any responses to this entry through the RSS 2.0 feed. You can leave a response, or trackback from your own site.